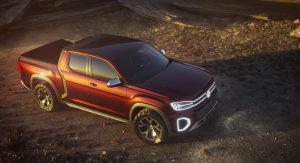 VW’s surprise for the New York Auto Show was none other than the Atlas Tanoak Pickup truck concept. 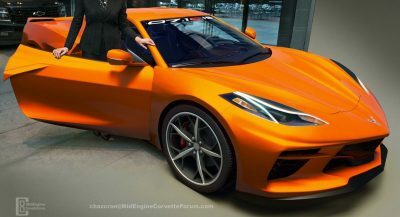 The concept is powered by the company’s 276hp 3.6-liter V6 engine paired to an eight-speed automatic and the 4Motion all-wheel drive system. VW claims the Tanoak is capable of a 0-60mph in 8.5 seconds. 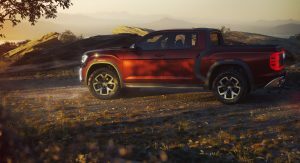 VW says that the Atlas Tanoak Pickup concept was named after a tree species that’s native to the Pacific Coast in the US and can grow up to 135 feet high, which is a nice way of pointing out the flexibility of the MQB architecture, as the concept is currently the biggest vehicle using these underpinnings. How Big Is The Atlas Tanoak Exactly? 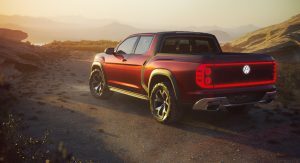 The Tanoak concept is 214.1 inches long, making it 15.8 inches longer than the Atlas SUV, placing it in the midsize pickup truck segment according to U.S. standards. Width is 79.9 inches, height is 72.6 inches while the wheelbase is 128.3 inches long -11 inches longer than the Atlas. The Atlas Tanoak sits 9.8 inches above the ground for better off-road performance while the 20-inch wheels are wrapped in 275/55 tires. The cargo bed is 64.1 inches long and 57.1 wide (50.4 inches between the wheel wells) and can easily fit ATVs and dirt bikes with the tailgate down. The German carmaker says that despite the Tanoak being based on the Atlas SUV, the bodywork has been completely redesigned, especially from the B-pillar back. The more rugged treatment of the front end includes new headlights and DRLs, a raised engine hood, different bumper and a centrally mounted winch. The new grille gets an animated lighting display, with white light running over the two crossbars. The handles on the rear doors are integrated into the C-pillars while the rear fenders are strongly flared for a properly dynamic look. The tailgate gets red LED strips on its upper and lower area, with the Atlas logo sitting in the middle, featuring animated lighting. 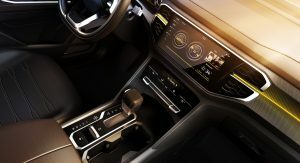 The interior sits five and has been heavily redesigned from the Atlas SUV. 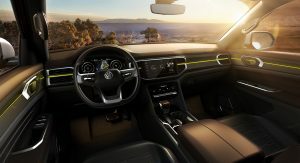 The instrument binnacle features the Digital Cockpit display and the infotainment system also gets a nice big touchscreen display but not as nice as the one in the new Touareg. 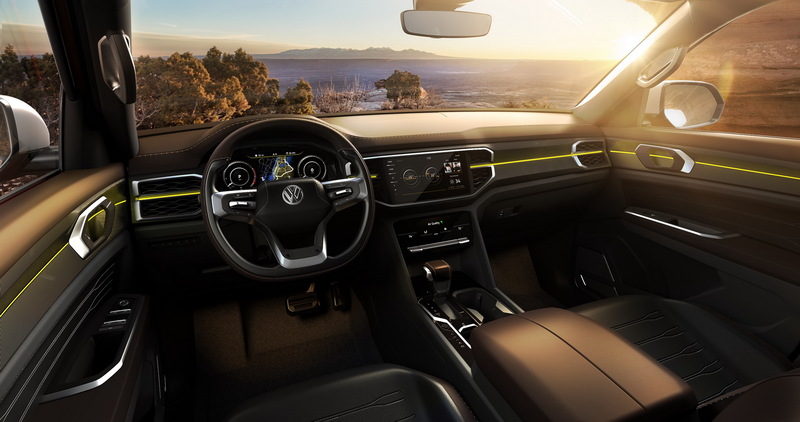 Ambient Lighting is integrated into the instrument panel and the roofline console while the center console features the newly designed shifter grip of the eight-speed automatic transmission. So, what do you think? Should VW build the Atlas Tanoak concept? Let us know in the comments below. 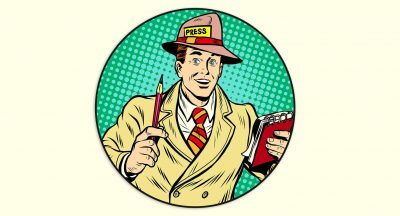 first thing first…! I mean, there is wall to build first! hardy har har, cause the two have soooo much to do with each other. The Ridgeline is your comparison standard? It KILLS that ugly-beyond-belief Honda. Probably not. And the big American continue to dominate the pick up truck market. Isnt it funny how the Europeans are always making fun of pick up trucks being “so American” and somehow beneath them…until they build one. Looks like the Americans were right all along. This is a concept and will be years late and a lot more boring in production form. there shouldn’t even be a discussion about building it. VW do it! Buy whatever you like, already, crank. Now this is the test for VW. Now if they’re smart they’ll do the right thing and get this into production, with styling that is is close to this as possible. 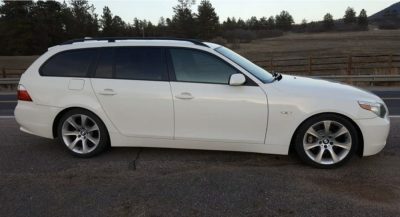 It needs a new turbo V6 as does the Passat/Atlas and the new 2-row Atlas, along with the VR6 as the middle engine. Build this and the new 2-row Atlas and bring back to the stunning new Touareg and you’ve got a winning hand. Then next year you introduce the baby SUV under the Tiguan. It’s time to get aggressive VWoA if you truly want sky-high sales numbers. A unibody pickup that actually looks like a pickup. I’d certainly consider something like this but I also question what they are doing with that cargo box overlap by the rear doors. The Ridgeline’s styling is a huge improvement over the 1st generation but it just looks too much like a car trying to be a pickup while not quite getting there. However the feature list for the Ridgeline is quite impressive. The trunk under the bed is one helluva novel idea. Give me that kind of innovation along with these truck like looks and I think VW will have a winner. They aren’t bringing that MB/Nissan over. Too bad they styled the Ridgeline like a mouse, and it’s killing their sales. This looks more like a Truck than the Ridgeline. OMG! LOVE IT! The illuminated VW logo looks so nice, not a fan of the overlap of the bed and cab though. Everything else is wonderful. That interior is beautiful. Build this and I’ll come back to VW… stick a TDI in it and I’ll place my order NOW! OMFG!!! I think VW is finally reading these car blogs and listening to what the people are saying about cars design. If they continue like this, it is way better for the brand. No, Volkswagen, people want a RELIABLE, WELL-BUILT pick-up, you feckless monkey-gassers. Take your cranky BS and go buy whatever YOU like, already. Let those people and companies without sin – cast the first stone. So far, I’m not aware of any other car company that gassed primates in an attempt to lie about their engines. And it’s a well known fact that Volkswagen’s quality is lousy. They’re consistently at the bottom of the heap in terms of reliability. But feel free to give them your money. I already bought what I like. I like this concept. But VW / Audi need to stop relying on lighting as a styling crutch. 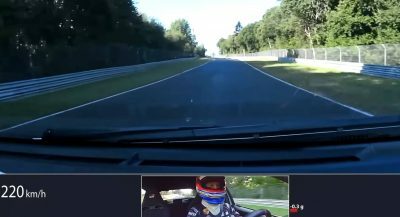 What started as being forward with LED technology is veering into circus territory with animated start-up lighting front AND rear, silly sequential turn signals, etc. What’s next – the entire car outlined in moving LEDs like a Vegas marquee? Lighting is very easy for other brands to copy, so find other ways to differentiate. I do like the lit slats on the front grille – they should keep this element. It’s the Mercury light bar reborn. The Ridgeline needs a direct competition, this should be a viable option. 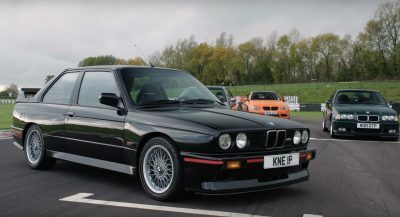 i like it…but please not with that current non updated V6 in the company of 300hp units out there these days. Not every pickup truck needs to be a BOF monster. While I like the Idea of the Ridgeline the current generations minivan front end, stance and lack of cohesiveness in design are a killer for me. If VW can bring this to Market with near the same stance and visual impact, I’d be all over it. The lighting, some minor details and the tires would obviously be toned down for production, but really it looks ready to go. Bring it VW and hurry. I LOVE it. I’d really love to see a beefier engine option though. I don’t think we’ll love it back. Since the rest of world uses the metric system, and we don’t regularly see larger 4WD’s like the F150/250 or even the Ridgeline etc on our roads, what would be the nearest competitor size wise to this Atlas Tanoak? Size wise the Volkswagen Tanoak concept is considered mid-size. So about the size of a Ford Ranger or Chevrolet Colorado. The Ford F-150 is full-size. But it would still not compete directly with any of those trucks. They are body-on-frame (BOF) with longitudinal rear-wheel drive powertrains, available with four-wheel drive and a two-speed transfer case with low range. The Volkswagen Tanoak is unibody with a transverse front-wheel drive powertrain. Because it’s front-wheel drive based, it can’t use a transfer case. So to make it all-wheel drive, it uses a power take off (PTO) and rear axle driveline module (RADM) instead. There is no tranfer case or low range gearing. The Tanoak isn’t heavy-duty enough to compete with those other pickup trucks. It would be a more suitable competitor to the Honda Ridgeline. My only disappointment is that the production version won’t look anywhere this good. Yes, I’m preparing myself for that disappointment. You all are falling for another concept ruse. The production version will look like an Atlas with the back roof cut off. Do NOT expect these cool concept details and proportions. 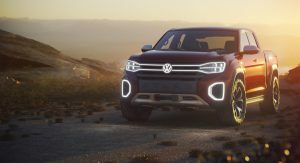 It’s also funny how much they emphasize the cab-body crease as if to look body-on-frame when it’s just a fat unibody SUV… You’re not fooling anyone VW.